Trine 2: Director's Cut was one of the games shown in a montage of third-party software during this morning's Nintendo press briefing. Finnish studio Frozenbyte is building a definitive console version of its well-received co-op puzzle-platformer, which is currently available for PC, Mac, Linux, PSN, and XBLA, exclusively for release on the Wii U this holiday season. The Director's Cut features Wii U-specific controls and an exclusive new party mode, "Magic Mayhem," designed for four-player offline or online play. Frozenbyte has made over 100 improvements to Trine 2, including a new coat of gameplay polish and changes to level geometry. 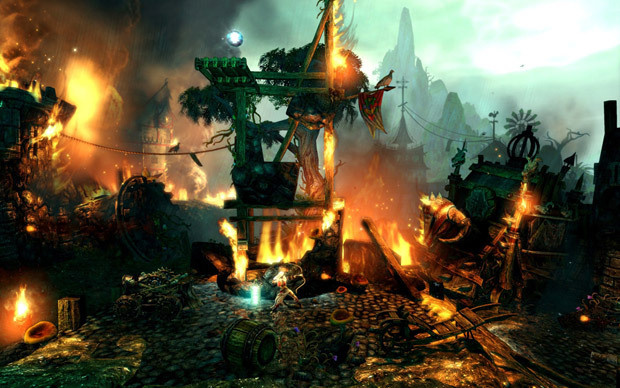 According to CEO Lauri Hyvärinen, the studio had to cut features from the game in order to get it out last year, and the Director's Cut represents the developer's fully formed "vision of Trine 2." Plus, since Trine 2 was such a gorgeous title, the Wii U hardware has allowed Frozenbyte to produce a console version of the game that looks about as good as the PC version. Also in development at Frozenbyte is a Trine 2 expansion that will be included in the Director's Cut. It contains six extra levels that take place in never-before-seen environments with new villains to fight, and each character gets some additional skills to ramp up the variety in puzzle solutions. We've reached out to Frozenbyte to ask if the expansion will also be making its way to other platforms, and will update this post with any comment we receive. In the meantime, enjoy the trailer above and the three screenshots in the gallery below.